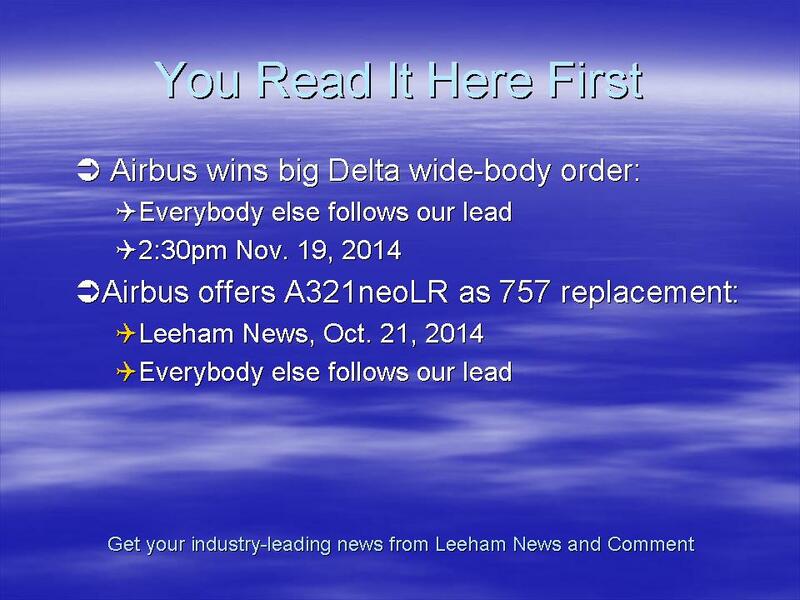 Airbus has won the hotly-contested competition for 50 wide-body airplanes, two sources tell Leeham News and Comment. Artist rendering of Delta Air Lines A350, via Twitter, original source unknown. Airbus will sell Delta 25 A350-900s and 25 A330-900s, our sources say. Rolls-Royce is the sole-source engine supplier. Boeing hoped to sell Delta the 787-9 and also offered five new 777-200LRs as bridge lift until delivery slots for the 789 were available, according to our information. Losing is a major disappointment for Boeing, not only because of the sheer number of wide-body airplanes involved but also because this is one of the Big Three US carriers; and there was the slim chance Delta might take Boeing up on the 777LR order, which would help fill the struggling production gap for the 777 Classic. For Airbus, winning Delta is a major coup for many of the same reasons: the sheer size of the deal, Delta’s status and, while the A330neo order won’t help the A330ceo’s production gap, this gives a good boost to the neo program and adds a prestigious name to the customer list. According to our information, Boeing couldn’t find early delivery slots for the 789–hence the offer of the 777LR–but Airbus was able to move the A350 skyline around enough to provide the airplane early. The A359 is intended for the Pacific and the A339 for the Atlantic. Delta is building up a major international hub at Seattle, where some of these airplanes will fly from. Airbus told LNC, “We do not comment on rumor or speculation concerning discussions with our customers.” Boeing declined comment. Delta did not respond to a request for comment. Delta’s plan was to announce this at Investors’ Day on December 11. Airbus sold to Boeing? looks like a minor typo. Cheers. “Airbus will sell Boeing…” Really? Now that is impressive! Seriously, great news for Airbus and Delta. I think the A339 will be an excellent TATL plane for them. So now, does Delta still need the 787-8s they have on order? Didn’t see that one, to be honest. I am somewhat glad the A330neo is in there as well, in the face of a number of people who IMHO just read a bit too much into a semi-public statement from Anderson which was in response to a question that wasn’t even specifically about whether the A330neo was still in the running. That A350 PhotoShop job looks great – can’t wait to see the real deal. Great win for RR as well! As for 787s – I would expect DL to still take those they have on order, but maybe upgauge them to -9s. It’ll be quite interesting to re-visit some of those previous discussions. The fact that it is looking to be a split between the A359 and the A339 is good proof that they are well differentiated products. I’m actually struggling to see the benefit for DL in doing that. But, I think we’ll have to wait and see how many options they take. If there’s a lot, then it could be that DL’s long-term long-haul fleet will be A330neos and A350s. Who would have thought? On second thought (with a night’s sleep on it 😉 ) – I agree with you, actually. Either sticking with 787-8s (possibly positioned with Virgin) or cancelling them outright might make more sense, actually. I doubt Delta is going to cancel the 787-8 order. Delta ordered even before JAL in 2005. At time the 787-8 was offered for less than a 767. Delta will have to pay a really modest price for its 787-8 on delivery date. I doubt Boeing now offered the 787-9 for a similar amount of money. Strictly speaking, NW ordered the 787s and DL inherited them. DL have been pushing the delivery date further and further out ever since. Boeing is weak in the middle of the big twin segment. The 787-9 is a bit small for transpacific, the 787-10 lacks payload range for those flights in real world conditions. The 777-200LR is heavy and the 777-8X is 7-8 years away. And denial doesn’t make it go away. “no early delivery slots” sounds like a feel-good to me. Atlantic was probably a close call. If the 787-9 is very good (is it? ), the relative simple stretch 787-10 seems like a hot machine for those routes. Anyway Delta invests in decent 18 inch wide seats on long haul economy, that’s good. And be sure there will be A350-1000 upgrade rights in the contract. Great scoop Scott! Congrats on another first off 🙂 any news on the 757 replacement at Delta? 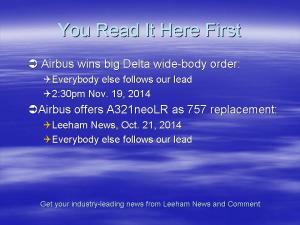 DL is looking at the A321neoLR, as is AA, UA, JBLU and others. Man, the butthurt is going to be strong with some people today…. Absolutely brilliant move on Delta’s part. They will fly efficient, reliable, comfortable A330Neo’s with 8 abreast 18″ seats. The A330 Neo is a simple and unbeatable combination of efficiency, reliability, and comfort. As for the A350’s, this a testament of how well positioned that aircraft really is. Light, not too big, not too small, and capable of ultra long haul. A perfect combination of perfect airplanes. Make no mistake, the 777-X will be dynamite and absolutely phenomenal. Can’t wait. However, it will be too much plane for most carriers, especially for US airlines. The 777-300ER itself sold poorly in the US. The 787 is somewhat left out like a middle child. Emirates decision to cancel the A350 orders is looking more and more of that of a spoiled brat since all major carriers now will fly the A350. That cancellation was initially sen as a blow to Airbus and a “devaluation” of the A350 by TC. Guess that’s not the case. All three US carriers will be flying the A35o’s and the order book growth spurt for the -1000 has not even kicked in yet. Was the Emirates cancellation the reason Airbus were able to get this order? As availability seems to have been key, would there have been A350 slots available to offer Delta without it? We will talk about this in our next Odds and Ends post, to be published overnight tonight (Wed, Nov. 19). While the EK cancellation hurt Airbus, it may well have provided earlier slots that enabled them to win the transpac half of this order. The real irony will be if EK does look at the A350 again and re-orders it! I don’t know how much it would have helped in the Delta bid, but EK’s A350s were scheduled for delivery from 2019 onwards . When would final offers have arrived at Delta? My guess is Airbus had the slots available knowingly when the A380 deal with EK was finalized. the delayed cancellation was strategic. .. and this seems to have worked. Are these firm orders for the A330neo? They would be the first ones. The other 127 are just MOUs. 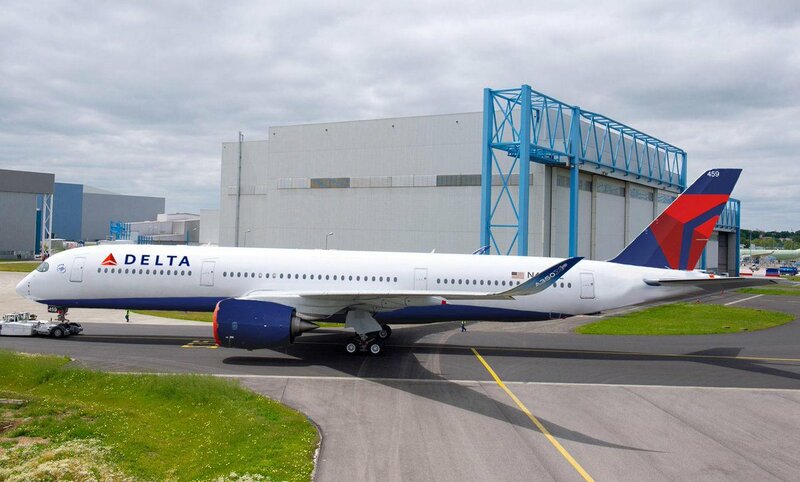 Delta is taking the first of the 242t variant of the A330 next July. So I guess we shouldn’t be surprised they went with Airbus for this order too. What I can’t work out is why they ignored their own existing 787 order, maybe these will be passed on to Virgin? So Delta was lying about the 787 and the A350 being the competing products. No issues with Delta going the way they did, but i will not believe anything they say in the future. Boeing should not either, 787 obviously was a stalking horse to get a better deal. Choice makes sense if trhey split them between Seatle and East Coast. No, they were competing for the Pacific fleet requirement. The Atlantic fleet was done and dusted the day Airbus launched the A330neo. Were they? Anderson made a semi-public statement in response to a question that didn’t even deal with specific airplane types, and he mentioned A350 and 787 were being evaluated. He didn’t specifically say that A330neo wasn’t being evaluated, nor did he specifically say the 777 wasn’t being evaluated, which we now know were both very much part of the evaluation process. So all of this “oh – but DL said the A330neo was out” was IMHO just reading too much into an off-the-cuff statement and then blowing it out of proportion for good measure. You won’t believe Delta in the future because, contrary to that out-of-context quote from Anderson, they were in fact still evaluating the 777? Furthermore, I would bet a pretty penny on the fact that Boeing was very well aware of the fact that they were competing against the A350 and the A330neo. If Airbus had employed that “logic” after DL’s 767-400ER order (or any other DL order prior to that) they would not have got orders for 45 A321s, 10 A330, 25 A330neo and 25 A350. Equally, if Boeing had employed that “logic”, they would not have got Lufthansa’s 747-8i and 777X orders. Delta snubs Boeing on wide-body order! Delta opposes Boeing on Ex-Im Bank! Delta looks to double gates at Seattle? Just look at that photo and you can see the the prettiest girl in the room got the nod. Kudo’s to Airbus – it great when a plan comes together. The announcement last week that AirBerlin canceled orders for 15 Boeing 787s gives Boeing an unexpected, big advantage in the contest for a big wide-body order from Delta Air Lines–depending on when Delta wants the airplanes. Behind this major win for Airbus, it seems that the 777 Classic as an interim solution is not an attractive deal for airlnes. Thars maybe the biggest consequence and concern for Boeing. I look forward to reading the next Scott’s analysis about the 777 Classic backlog and manufacturing rate. Well, 777-200LR/ER haven’t been going well in the last 5+ years. for the task set by Delta too heavy. I don’t think any interim solution is attractive if a permanent solution is available. In this case the A350 was available from the start. Delta may have chosen differently if it had been A350 + interim against 787 + interim. With A350 and A330 Delta has space to distinguish itself from ANA or other airlines with 9-abreast 787 and 10-abreast 777 on routes to Asia. Delta operates its 777-200ER/LR at 9-abreast (291 seats/ 37B/36Y+/218Y) and 767 at 7-abreast. Also A330-300 at 8-abreast with (293 seats/ 34B/32Y+/227Y) from Seattle to Tokyo. A 777classic could be an interim solution for airlines already operating 777 at 10-abreast. Delta also operates its aircraft for rather long times. Except of three aircraft Delta’s 747 are older than 24 years. Not a good case for ordering new outdated aircraft now. By the way some breaking news (and better news for Boeing) from Kuwait Airways, they are going to take 10 B777 (Classic I guess). Nothing ‘breaking’ about that, a possible Kuwait 777 order was reported three months ago. It’s old info but to bring it up again in this time may help reassure Boeing’s investor confidence after losing the Delta order. Especially so because Boeing missed a 777 Classic sales opportunity. TLCing “Boeing Investors” isn’t really a central concern here, is it? Sorry, I didn’t quite get you. What is “TLCing”? @Uwe, what I was trying imply was that with the looming 777 production gap problem, investors would feel that Boeing has missed a big opportunity to sell a bunch of deep discounted 777s to a capex conscious airline like Delta. Maybe it’s a coincidence, but you do have to wonder about the timing of the Kuwait order news release. And yes, there are other worries too. timely (but inofficial) news in the press appears to be Boeings way of information warfare. Remember the “Air Berlin buys another bunch of 787-9” 3 days ahead of the scheduled NTSB presentation about “Burning Batteries”. This buoyed share values well beyond the next weekend and seems to have fended of any dip from the negative connotation of NTSB presentation. At the time I had an email exchange with the journalist writing about it as german news referenced an “Air Berlin potential order change -8 to -9 to get away from 787-8 delays and internal problems”. Took him days to fix his text, the headline was never changed and no correction published. With a bit of care you will find a rich buquet of fake and/or misdirecting news to the advantage of Boeing and/or disadvantage of Airbus which never, never have a direct Boeing source. Boeing has demonstrated that it can be flexible in order to realize customer needs all the time and it’s difficult to accept the fact that its being said that for this case of Delta’s order Boeing refused to listen. Delta’s Execs are already a major player in the US economy and for them to champion the interests of a foreign conglomerate at the expense of the local talent is quite unpatriotic and unfair for their fellow countrymen toiling excellently to develop aerospace. A 50% share of the order between Boeing and Airbus was going to a good compromise. This order should be annulled and re-looked afresh. Victor, are you equally outraged when the likes of British Airways, Air France and Lufthansa order large numbers of Boeing planes? Just wondering. Airbus won on delivery slots and pricing. It just dawned upon me, but I guess everyone here realizes that DL’s Seattle hub is Boeing’s home base. Btw., stopped by the Charleston Intl. Airport the other day, and noticed five 787s (?) parked outside the adjancent Boeing facility. One has the Avianca logo on it. Boeing lost because they are so successful they didn’t have any slots left for Delta. They stood firm, refusing to deeply discounts their excellent aircraft, contrary to other cheap products/ salesmen. Check the facts before going to nationalisticclish comments !!! What a stupid action from Delta, if they knew that they are in need of long range plane around the raised time. Why they cancel NWA – B787 at early stage. Do you mean 787 are not so good …. lese majesty ?? ?